Remember when Andrew first met the Messiah? What was his first reaction? He ran to tell his brother Peter the Good News! Well, that’s how I felt when given a wonderful children’s book entitled, “Where Are The Other Nine?” (The Story of the Leper that Came Back to say Thank You) by Max Reid. I found an excellent Biblical resource and wanted others to know! 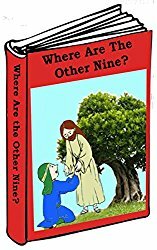 Today, I am reviewing “Where Are the Other Nine?” Written from the point of view of a Samaritan family; it places us in the shoes of the one afflicted. I found it relatable and intriguing, inviting much discussion of faith, trust and how we treat others. At first glance, gazing at the cute cover, I mistakenly believed this book to be for those of a younger age. (It’s a sweet cover, as are all of Max’s books.) But what I discovered was so much more. These books are targeted perhaps toward the 4-10 year age group but easily could be used as practical Biblical instruction in Sunday School, homeschooling, children’s church or during family devotions. This thought-provoking book is based on the miraculous healing of the ten lepers by Jesus found in Luke 17: 11-19. This event opens up a myriad of questions which transcends into our modern age, bringing to light many “what if’s” to a young person’s mind. Levi’s father, through no fault of his own, became one of the lepers and an outcast. He couldn’t work any more. Therefore he had no money and had to beg for food, clothing, warm blankets. Money meant nothing since he couldn’t enter a store to shop and had to rely on the kindness of others for his very existence. And what if that leper was you? How would you like to be treated? With compassion, help or disgust? What if that outcast was your own parent? You’d never feel their arms around you, kiss your cheek or tuck you in at night. Life certainly would take on a different perspective, wouldn’t it? Would you be kinder? What did Jesus do and what does that teach us? What becomes most important in your life? 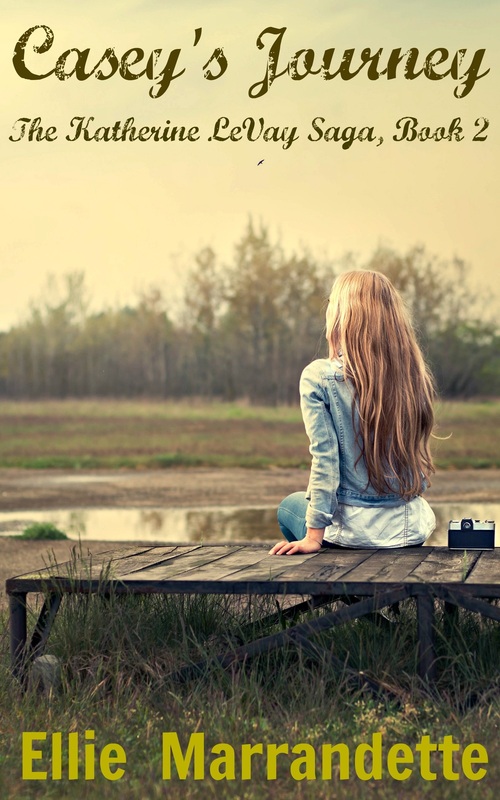 How would you feel if you were suddenly isolated from your loved ones because of illness? What would be your first reaction? Would you shake your fist at God and blame Him? Would you pray, trust in God or turn from Him? The author, Max Reid is a talented writer who has taught children’s Bible Studies in his church for 18 years and it shows. Beautifully written, this book draws the reader in by presenting the gospel adapted for today’s generation. I urge you to purchase and use his books in your church or family’s devotional time! Thinking of “Dieting?” Let’s Be Practical, Read This! It’s nearly the start of the “Diet-Season” when millions enthusiastically begin a diet on January 2nd and . . . usually fall off that bandwagon three weeks later. Why? Failing on a diet plan is usually not because we don’t know what we should do. Most realize we: 1. eat less 2. exercise more 3. slow down and 4. drink water, etc., etc. . . . Yet we fail time and time again, even when we believe we are doing the right thing! That’s frustrating and self-defeating. Weight loss is much more than mere willpower. There is no magic formula. Since we are each uniquely created, it’s primarily an individually mental, physiological and Spiritual challenge. It’s also a matter of understanding the scientific reasons behind the “why” we can self-destruct. Why losing weight isn’t simply a matter of willpower! The secrets to weight loss success and so much more! Truth is, God never meant for us to live on complicated, fallacy-laden, restrictive diet plans which clearly reject our Maker’s fundamental psychological, physiological and spiritual wishes. Healthy-living is not adhering to a “penance principle” of restriction and suffering. God set Adam in a Garden for a reason and provided the perfect Master Plan for health. Yet people needlessly consume “magic” formulas: “sticks and twigs,” processed packaged foods, drink tasteless protein shakes or restrict their diet needlessly. Why? There is no need to deny oneself chocolate, cheese, eggs, potatoes, bananas, shrimp or any other food while consuming only rice cakes and celery. Avoidance and flagellation will not get one closer to God unless he enjoys living as a monk! God gave us the perfect dietary plan in Genesis 1:29 and 9:3. He also instilled us with common sense. I address the fact that we’ve each been formed uniquely with a different chemical make-up. There is no one-size-fits-all diet plan but there are physiological truths we should live by! Discover true vitality through a sensible every day eating plan, honoring God in the process! “Life’s Too Short to Eat Bad Cheese” is filled with realistic illustrations, practical applications and beneficial common sense! If one concentrates on nutrients, they will naturally be healthier because their body will crave healthier choices while resisting uncontrollable cravings. But how does one do that??? I explain how. Read this book to discover by which means you can become stronger, develop strategies and routinely overcome temptation, becoming confident as a New Creation! UPDATE: Don’t be dismayed (if it’s still there) by seeing the amazon price of $47.82 – amazon is holding my publisher hostage in order to receive 40% commission! The Ingram Group is negotiating for us. The paperback book can be purchased from Outskirts Press at the very affordable price of $13.46, or amazon.com or Barnes and Noble as well as in e-book format for only $7 on https://outskirtspress.com/lifestooshorttoeatbadcheese. Please don’t give up and settle for second best! You are worth far more than that! As you know most people gain weight over the holiday season which now lasts from Halloween until the Super Bowl. Then feeling guilty, they’ll desperately attempt a diet beginning on January 2nd. This lasts approximately three weeks if they’re lucky – or until the first football playoff game if not. What’s the underlying reason for failing on a diet plan? It’s usually not because we don’t know what we should do. Most realize we should eat less, exercise more, slow down and drink water. Yet we fail over and over again! That’s frustrating! Weight loss is primarily a mental and Spiritual challenge, much more than mere willpower. Please don’t settle for second best!” You are worth more than that! You would never think of throwing trash on the floor of the Holy Temple in Jerusalem, so why do you trash your own temple of the Holy Spirit with so many unhealthy foods? My book, “Life’s Too Short to Eat Bad Cheese . . .” will make the perfect Christmas gift this year. With over 230 pages of practical applications and encouragement, it targets our mind, body and spirit. It’s not another diet book; it was written as a positive philosophy on how to honor God with our earthly bodies by choosing wisely. 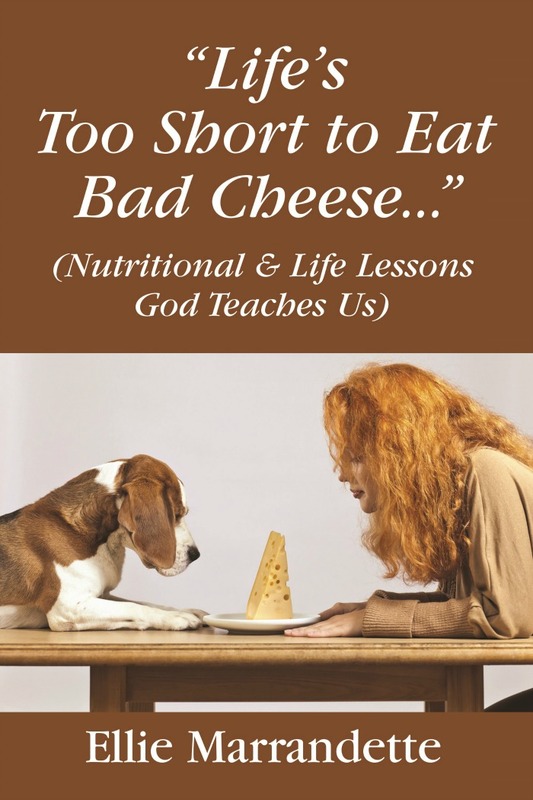 “Life’s Too Short to Eat Bad Cheese” (Nutritional & Life Lessons God Teaches Us) addresses this Truth: God never meant for us to live on complicated, fallacy-laden, restrictive diet plans which clearly reject our Maker’s fundamental psychological, physiological and spiritual wishes. God set Adam in a Garden and provided the perfect Master Plan for health. Today however, people needlessly consume “sticks and twigs,” processed packaged foods, drink tasteless protein shakes or restrict their diet needlessly. Why? Now please don’t respond with comments like “Well I’m allergic to eggs or shrimp, so that’s a Biblical fallacy!” God didn’t have to advise, “don’t put beans in your ears . . .” either. He gave us common sense and a world where we live under Grace. (We also live under the 2nd Law of Thermodynamics, meaning everything’s winding down.) Everyone’s been formed uniquely with a different chemical make-up. I address that in my book. “Life’s Too Short to Eat Bad Cheese” is filled with useful illustrations, realistic applications and common sense! I pray that this encouraging and intriguing non-fiction work will motivate you to tackle the many mental, physical and spiritual connections to food which challenge you. Discover your true vitality through sensible eating, honoring God in the process! Every author who devotes their entire heart and soul to writing realizes how exciting it is to see a finished work come to life. For me writing will always be a labor of love. Therefore I am pleased to announce that my sequel to Sometimes Marriage is a Real Crime, entitled Casey’s Journey, has debuted. Why does God allow bad things to happen to the innocent? The second novel in the Katherine LeVay series, follows not only Katherine’s life after the death of her philandering husband, but answers the question as to what happened to her abducted child. When Richard and Katherine LeVay Madison’s five-year-old daughter is kidnapped in New York City on a family outing, we discover that even the evil events in our life can be molded into beauty if God is the Potter. Katherine’s resentment toward her husband’s indiscretion is but one of several events which ultimately leads to the downfall of her marriage. Years of living with the hopelessness that her daughter will never be found, Katherine leaves the States for a new life in picturesque Sorrento, Italy. But even her flourishing Bed & Breakfast set in a renovated Renaissance Inn won’t quell her heartache and longing to discover what really happened to her beloved daughter. Casey is told her parents, aunt and uncle are dead and she must remain at the “orphanage” until someone adopts her. A year and a half later the child feels unloved, unwanted and rebellious. There is one couple however who sees the child’s potential and brings her into their gypsy military lifestyle. As we follow Casey’s journey through the twists and turns of life into adulthood, she sees how those who now love and protect her format her thoughts and dreams for a more promising future. Stationed in Myrtle Beach, South Carolina, golf comes calling and Casey exhibits many of her birth parents athletic characteristics. She discovers a talent and a competitive atmosphere she thrives in. That is until a family tragedy occurs, challenging her beliefs and enticing her into a scandalous situation. If it’s true that tribulation builds character, then Casey has an abundance of it. Throughout the novel we question which shapes us more, our heritage or environment? Will Casey discover the truth regarding her past and is it possible that God meant all these tribulations for good? Sometimes Marriage is a Real Crime reduced to 99 cents. As a Christian counselor, whenever I feel discouraged, my first reaction is to delve into the Scriptures for serenity and direction. My next step is to reach out to another “Wise Woman of God” for counsel. There is so much comfort in knowing that another woman truly understands. 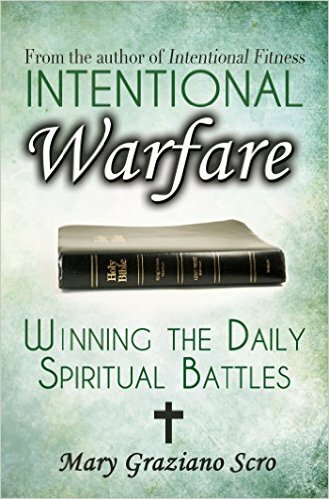 When you purchase Intentional Warfare, Winning the Daily Spiritual Battles, you will find you always have that Wise Woman of God by your side when challenges or discouragement arises. Just flip to any chapter and put on another protective piece of the Amour of God. Using the acronym: W.A.R.F.A.R.E, each chapter addresses the challenges we mentally, physically and spiritually encounter in our typical walk with the Lord. Her action packed “Daily Training Exercises” at the end of each chapter will empower you to confront and acknowledge that “yes you can overcome the slings and arrows” Christians face daily. “When we do get hurt, we have the opportunity to choose one of the greatest activators of God’s love: forgiveness. We can forgive those who hurt, persecute, lash out at, and betray us. We don’t have to feel like forgiving. We don’t have to tell the one we’re forgiving that we’ve done so unless God directs us to do so. Often we will still feel hurt or angry. Fully experiencing forgiveness—no more hurt or anger—is a process that takes time. It starts with our choice to forgive and continues to completion with ongoing choices to keep forgiving (Matthew 18:21-22). This is the type of book you’ll want to read book multiple times. The first to motivate, the second time to empower and the third time to savor as you tackle the challenges and eventually enrich and energize your Christian testimony. Today only!!! Don’t miss out on Mary’s generous offer to pick up a copy of her ebook for only 99 cents on Amazon.com. After reading you’ll not only be able to face and overcome normal day-to-day life struggles; you’ll also emerge victorious. Desiring To Be Intentionally Fit? A Must Read! 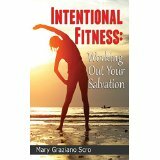 Inspirational author Mary Graziano Scro, epitomizes the total mind, body and Spiritual connection to fitness in her new book, Intentional Fitness: Working Out Your Salvation. As Mary asserts early on, “Only by being intentional in our Spiritual life can we become intentionally fit in our personal lives.” So True! Ms. Scro stresses that our life’s goal is not for man’s adoration but to honor and glorify our earthly body for our LORD. Each of us should strive to be healthy, not only to be physically fit but to ultimately honor God and live as He designed us to live; with energy, vitality and True Joy. Why then, when we desire to become healthy, certain obstacles prevent us from accomplishing that feat? Mary urges us to not believe Satan’s lies. The devil has no power over you unless you allow him to fill your mind with defeat. You are an imperfect being, so what? Aren’t we all? God understands our imperfections and is ready to restore us if we seek Him. The author addresses the fact that to fully accomplish any health goal, one must understand how our inward thoughts and actions affect us. Recognizing what ingrained habits and thought-patterns obscure our path will allow us to rid ourselves of any sinful baggage which holds us back. Only then, using Godly principles, can we strive for success. Intentional Fitness is aimed at dispensing practical applications and steps to reach personal goals and provides in-depth, thought-provoking questions at the end of each chapter. Since each of us have different personalities and trials to overcome, each question will assist the reader in discovering what motivates his/her mind-set and actions toward victory or failure. Wonderfully written and presented in her humorous, encouraging and motivating writing style, Mary Graziano Scro’s inspirational book is a short 108 page easy-to-read delight. Mary discloses personal analogies and illustrations which many of her readers will relate to. Her testimony of how she met her husband is priceless! She reveals how God answered her prayers and met her needs and will do so with you as well, if you are truly ready to lay your burdens down and let God take over. Intentional Fitness: Working Out Your Salvation can be found on Amazon.com for only $2.99! For that price you can even purchase an additional one for a friend!